Related California is planning to start construction on the 56-story tower designed by Architect Rem Koolhaas and the Office for Metropolitan Architecture (OMA) to rise at the corner of Folsom and First, along with the Fougeron Architecture designed podium and mid-rise along Folsom and Fremont, in Spring of 2016. 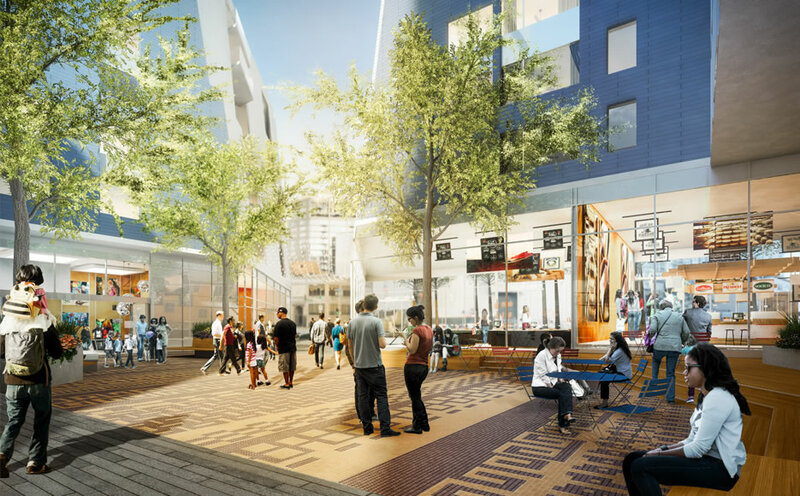 Plans for a total of 653 residences, 31,500 square feet of retail space and a five-level subterranean garage have been drawn for the Transbay District block, including 491 apartments and 162 condominiums. 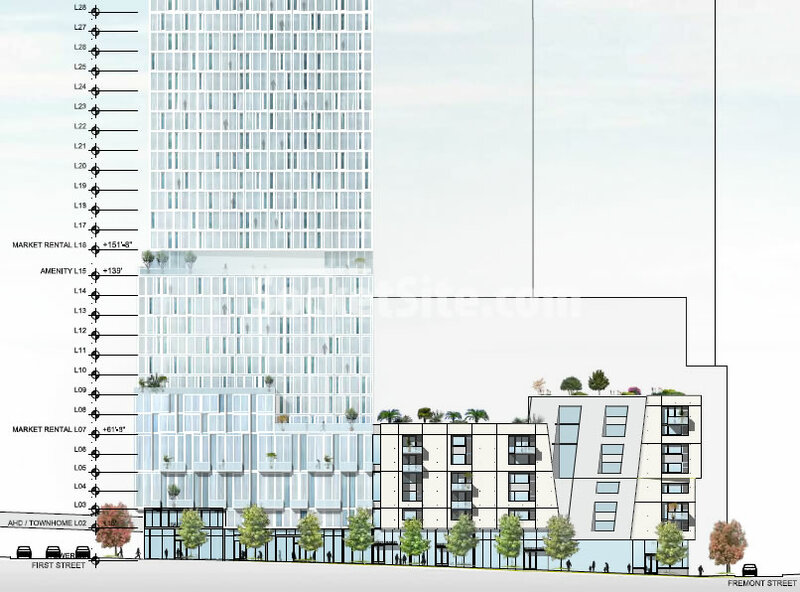 And as designed, the 162 market-rate condominiums will occupy the top 23 stories of the tower, separated from the 314 market rate rentals by an amenity floor on the 33rd story of the building. 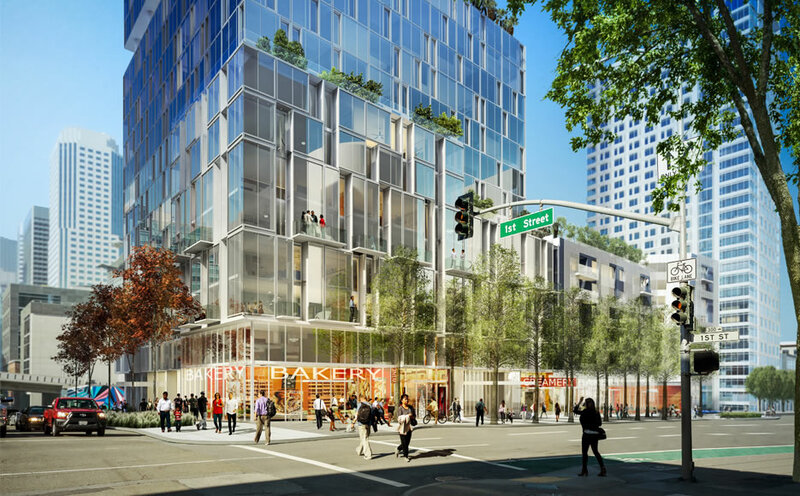 The project’s 177 below market rate units, earmarked for San Francisco residents earning up to 50 percent of the area median income, will be located in the tower’s podium and mid-rise. Construction of the Transbay Block 8 development is expected to take between 36 and 45 months to complete, including the mid-block pedestrian pathway and Urban Living Room which will connect Folsom and Clementina in an effort to help support the retail which will line the paseo, and to help build a sense of community as well. 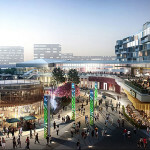 The Bay Area’s Most Contemporary, Lively And Modern Project? 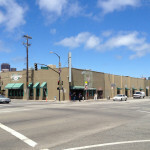 Is Whole Foods coming here? I don’t support the BMR units in this project. My preference is to see the developers pay the fee and/or build affordable housing in the more southern neighborhoods. This will uplift those neighborhoods, increase safety, more retail and create better neighborhoods thruout the city. Keep in mind that neither in-lieu fees nor building below market rate units off-site are options for developments within the Transbay Redevelopment District. That’s why the developers of 181 Fremont have been quietly negotiating a special exception to the rule, as we first reported two weeks ago. Yes, that’s right. I would hope they could negotiate that ruling. Bringing BMR units does nothing really to help families with children (necessarily) integrate into dense, high end downtown areas such as this. I suspect even the BMR’s will only attract mostly singles, young couples or some seniors. How much better would it be for this program to support new, family type housing in the outer neighborhoods. Not to mention the BMR units still have to pay the same HOA fees as everyone else. Any building could essentially evict all BMR residents by making the HOAs high enough that no BMR resident could afford to pay. Why not have some economic diversity? I applaud the builder for not trying to get around the on site BMR requirement. Looks good. What the hell is a “paseo” though? I guess “alleyway” didn’t sound fancy enough. What gives? I thought the Transbay skyline was planned to break out of the 600 foot tabletop effect of the financial district. After these towers are all built out, only three towers will have broken that peak. The remaining will all be in the 400- 600 ft, tabletop range. Los Angeles currently has 8 towers over 700 ft. tall with another under construction, and with all of this massive development, SF will only have 5 towers over 700 ft. Tall in its skyline. LA will still remain the champ with the tallest skyline on the west coast, and SF will continue to have its 500-600 ft. Plateau. And why does it matter at all if we have some towers in the 400-600′ range? and if LA has some taller towers? Seriously, what’s the point of being the “champ” or not? And since when did it become a game of winning? The skyline looks very awkward right now, especially with 600 Montgomery and 555 California sticking up on the north end. That’s the citizens of SF’s own fault. They voted to restrict heights after the Transamerica and Bank of America towers got built, so they’re going to stick out awkwardly no matter what. “600 Montgomery” Who says that? And I think the skyline looks just fine; the, ahem, Transamerica Pyramid stands out much better in it’s location and with the current build than if 600 foot towers continued northward. The comparison with LA only matters insofar as LA has a more interesting looking skyline. For all that I’d love to see S.F. have a tower taller than L.A., at a general scale it’s not feasible to compare the two. The population – and hence tax – based of L.A. is inordinately larger than San Francisco. Besides, San Francisco’s skyline leaps up from the Bay, which gives even the (comparatively) shorter buildings a stronger presence than downtown L.A.’s accretive pile. you might be comparing apples to oranges. with respect to LA’s downtown, there is no “there” there. Also, the number of skyscrapers and large buildings in downtown SF far outnumber and outshine that of downtown LA or Seattle. I would suggest taking a walk around downtown LA. Starchitect is not a word. (But don’t tell try to tell the NY Post that!). Rem is an architect. Awkward is not a relevant word ever, when it comes to describing a skyline. Skylines evolve over time, relevant to economic times, zoning, height limits, design styles, architects, cities own needs and location. Cities are never in competition with each other over skylines and heights. It just does not ever matter. People who admire and thrive on the sophistications of urbanity do care. But, you being a Noe Valley resident and all, that explains your slant. Interesting, rather silly comment. Not really sure what you mean or how Noe Valley could possibly have ANYTHING to do with the comment. Would my opinion appease you more if I say, lived in Pacific Heights, or say, The Mission? or how about Oakland? What does “sophistications of urbanity” even mean? Is the LA skyline awkward or sophisticated? what about NY? lots of skinny, tall, supertalls mixed in with lower scale buildings. How is “awkward” even measured? Is it valid only when in comparison to another city? and which city? and why? Well let’s be fair; you definitely veered into hyperbole when you said cities “never” compete over skylines and heights. Chicago and NYC had a very real competition for decades, and both take great pride in (and market) their skyline. And clearly some of the new capital centers of the Middle East and Asia think that an impressive skyline (versus shorter but bulkier buildings, which would have the same floor area) are the way to go in order to compete in the world market (and the market of public opinion)… people may enjoy the roads, beaches and indoor ski areas of Dubai, but they go for (and the city has become famous for) its tall buildings. All that said, I agree with your basic sentiment, in that a more densely built SoMa will be a good thing regardless of whether, e.g., it rivals or surpassees L.A. or Vancouver. 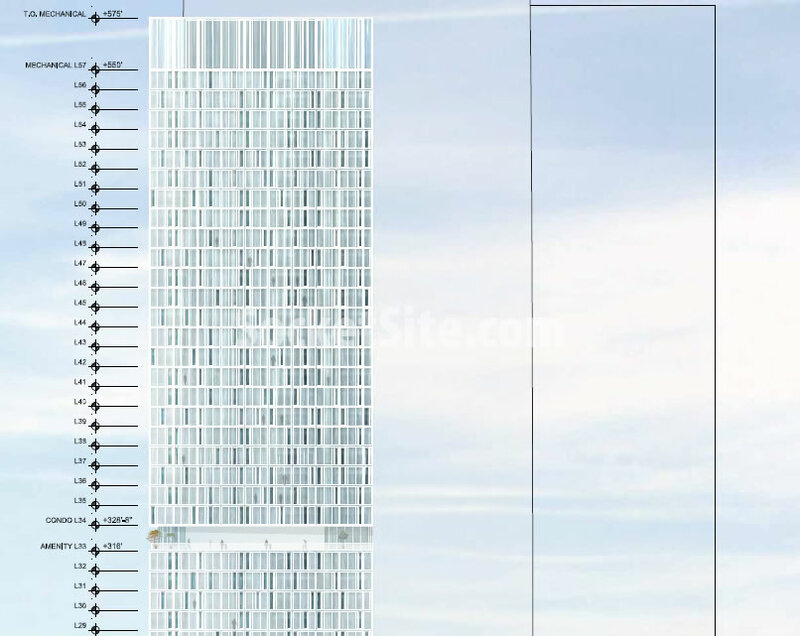 There are some other drawings which make this tower look to be an exceptional addition to the skyline. And yes, i admit that i wish it were taller. Yet, the mindset with the remainder of the transbay towers seems to have shifted to more interesting stararchitect based architecture. This is a good change because the likes of horrible and cheap designs such as the forthcoming 299 fremont and 340 fremont were taking the whole new transbay skyline down the same, old, tired path which gave us a lot of today’s mediocrity. The real issue is not so much the height, be it 600′, 700′ or 800′ or even higher…what should concern people is the idea of a mass of buildings all the same height (much like what happened up and down Market St in the 70’s & 80’s, all the developers built to the maximum 400′ so there is now a solid 400′ wall from the Embarcadero to 1st St). Seattle planners spaced buildings to give a more varied skyline, LA’s skyline is dominated by Library Tower (? not sure that is the name) and the downtown LA skyline has a nice massing of buildings. NY and Chicago are distinctive skylines that just happened with no thought to “skyline massing” SF haveing a relatively small CBD needs to give more thought to it’s skyline than other cities. Good grief. To all those complaining about how the Transbay plan was supposed to break up the skyline and SF “needs to give more though to it’s skyline”…the reason WHY this tower is zoned for 500 feet is because Transbay gave a tremendous amount of thought to its skyline. The Transbay/Rincon Hill plan was to give three peaks. One a cluster of skyscrapers on Rincon Hill (which although not as tall have boosted height due to the hill), the second the tallest of the Transbay towers, and the third good ol’ Transamerica and BofA. The skyscrapers in between are meant to act as waves descending and then rising from and to each peak. The reason this block is not zoned for 700+ is because it contradicts that desire. [Link in my name generally shows the massing desired]. As for LA, LA has height but SF’s skyline will be unquestionably better once these towers are built. Not to mention there are more parcels zoned for 750+ towers (which can soar past 800 once crowns are implemented) that haven’t even been designed yet…one across from the terminal on Howard, and then the Golden Gate University campus. I can tell you that sharing an HOA with subsidized units is a nightmare. I’m not sure how the arrangements will be with the transbay developments. Having nearly 30% “affordable” units is quite a bit and I would caution any market rate buyers to be cautious. The chasm between the market rate residents who want the common areas maintained at a deluxe level and the BMR residents who can’t afford the resulting HOA increases might lead to “HOA control” or some other sort of subsidy.